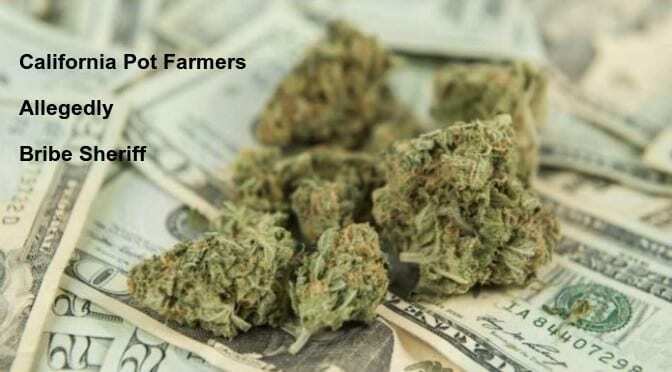 Two cannabis farmers from Northern California face bribery charges after offering to pay a sheriff $1 million to look the other way and ignore their pot-growing activities. Siblings Gaosheng Laitinen and Chi Meng Yang were on Wednesday charged in the U.S. Attorney’s Office with trying to bribe Jon Lopey, Siskiyou County Sheriff, to shield their operations from raids. Unsealed on Thursday, the complaint also accuses the pair of conspiring to sell their harvest in Missouri, which is currently undergoing efforts to legalize cannabis use in that state. According to Lopey, the drama started on May 17, when the sheriff and a department captain met with Yang in his Yreka office, approximately 300 miles north of San Francisco near the California border with Oregon. Lopey accused Yang of asking him to protect 10 commercial weed farms from raids in exchange for $1 million, donated to any cause or charity of Lopey’s personal choice and payable at harvest time. It is illegal to grow marijuana outdoors in Siskiyou County, especially not farms. Residents may only grow up to 12 plants at once, and exclusively indoors. After the meeting, Lopey got in contact with federal authorities. Together, they decided that Lopey would fake cooperation and secretly record future encounters. Yang gave him a partial payment of $10,500, paid in cash, and met with him another six times. At one meeting, Yang’s sister paid cash to the sheriff, but she accompanied Yang to quite a few of them. On Thursday, police arrested Yang. He now has a court appearance scheduled for Friday. Laitinen remains on the run and officials continue attempts to find her. Lauren Horwood, the spokesperson for the U.S. Attorney’s Office, said that Yang is still without legal counsel. According to Lopey, deputies have now raided Yang’s farms. They made 13 additional arrests and uprooted approximately 1,000 plants. READ Will small farmers pay for Proposition 64? Throughout California, marijuana growers have been flocking to rural communities in large numbers. They are cashing on the rising demand for cannabis across states and country. In 1996, California became the first state to legalize medical marijuana, and in November last year, voters made it legal to use weed recreationally too. Several others states are now also considering similar cannabis laws. There are large volume Rural community are involved in the business. The rising demand for Marijuana across states and country. California became the first state to legalize medical marijuana, and in November 2016, voters made it legal to use weed recreationaly too.